The first ever race weekend for the FIM Enel MotoE™ World Cup will take place alongside the Gran Premio Red Bull de España in May, but the agenda is full ahead of the debut and it’s all action behind the scenes. Preparing for a whole new class of competition to become part of the MotoGP™ World Championship is a challenge that brings together everyone involved in the Cup, and the MotoE™ Summit was designed to detail all aspects of this new parallel path of racing. 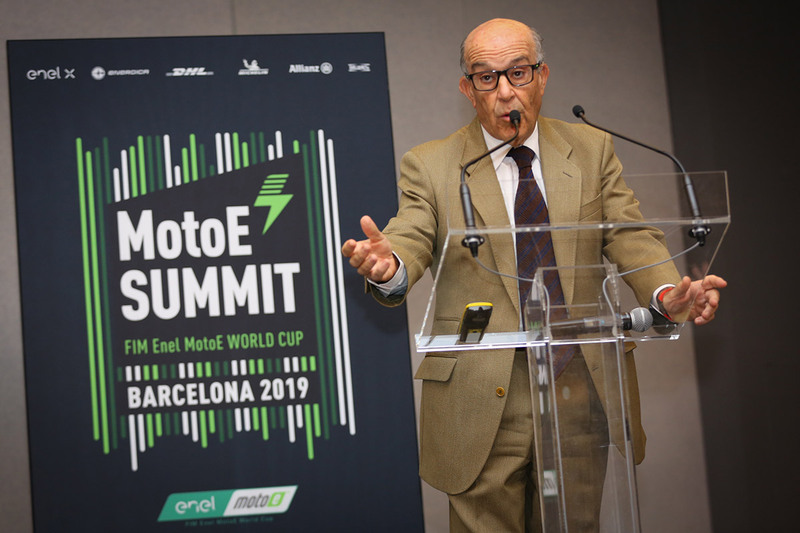 Dorna CEO Carmelo Ezpeleta was the first speaker and introduced the Summit, detailing the role of Dorna in MotoGP™, motorcycle racing and now the FIM Enel MotoE™ World Cup. He emphasised the personality of each of the teams and the goals of the Cup, which he laid out as being focused on high quality racing. Dorna Sports Managing Director Pau Serracanta recounted the birth of MotoE™ and the MotoGP™ partners who join the project as well as those who come on board for the new Cup. Dorna Sports Managing Director Manel Arroyo talked about the incredible TV and broadcast presence that will be a key part of this new competition within the MotoGP™ World Championship. Social media, the communications plan for the new Cup and its presence in the MotoGP VIP Village™ were on the agenda, too – giving the room a detailed overview of each and their roles. Executive Director of the Cup, Nicolas Goubert, took a key role in proceedings. Giving an overview of everything about the competition itself from the number of laps to the design and layout of the E-Paddock, the intricate workings of the Cup were explained. That included focus on the teams, riders and safety, as well as how long the races would be and one important fact: ensuring the power is constant from the start to the end of each 15-minute race. Motorbike manufacturer Energica were represented on stage by CEO Livia Cevolini and CTO Giampiero Testoni, and they talked about the company’s interest in the world of electric motorcycles and how it grew to see them create the machinery chosen to compete in the Cup. CEO Francesco Venturini represented Enel X, who are the title sponsor and set to power the Cup using renewable energy, to talk through the challenge of powering this newest class of competition.